Today is March 21, or the 21st day of the third month of the year, 3-21. 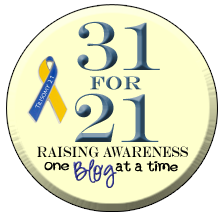 3-21 is also a significant number in the Down syndrome community as it represents the third chromosome of the 21st set, which is the cause of Down syndrome. Tens of thousands of families with children with Down syndrome as well as people with Down syndrome are wearing T-21 tee shirts, mismatched socks, and donning yellow and blue for Down syndrome awareness day. Me, I am sharing others' posts and liking lots and lots of statuses, but beyond that I am a wall flower at this great big wonderful party. You can read lots of these great stories at the "Day in the Life" series. Perhaps I am tired, I have advocated for Alex for twenty years and now she is in college. For twenty years every single waking hour was spent thinking about or advocating for Alex. I now live by myself, all three kids are in college and my husband has left. I am on to the next phase of my life, graduate school and a future in policy as it impacts people with disabilities. Down syndrome is not part of my day to day life and to me that is the way it is supposed to be. Kids grow-up and move on, just like everyone else. So today I am not wearing a T-21 tee shirt or mismatched socks, I am in Boulder picking my son up for spring break. I did not bring yellow or blue, and doubt I will even see anyone who is wearing anything related to Down syndrome today. Today I am merely a mom of three incredible, amazing kids. Yes, we have been graced by Down syndrome and yes it was my life for 20 years, but it is not anymore. My “day in the life” has passed. I have no idea what will happen when Alex graduates in 2017 and I can’t worry about that now. But for tens of thousands of other families World Down Syndrome Day is important and the awareness these parents are creating today is unmeasurable. I applaud each and every effort as I sit here, take a deep breath and rest. Alex and I did it….we got through school, got through graduation and got to college. It was an amazing journey and kept me on my toes for twenty years, but today I rest and save my energy for the future. I’m sure I will need it. 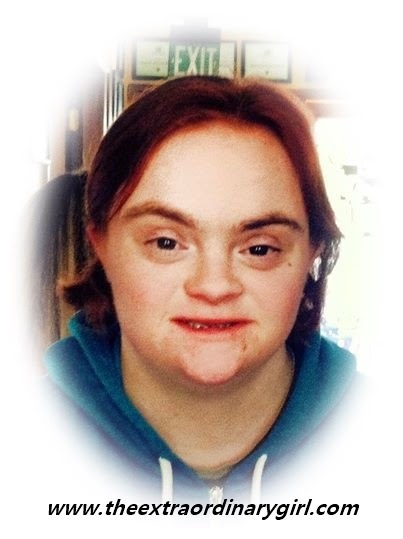 Today we were noted as number five in the top seven things about Down syndrome in Tiffany’s blog. Check it out and note the reference to our book. It is geared for young families and shares our journey. It may be meaningful to you. I also like this video, it says it all to me. And finally, the superstar who has made this amazing life possible. Today I am going to celebrate what we have accomplished and how Alex is living her life just like she wants. Alex creates awareness every day..... All by herself. I can't figure out the hop pinky but hey, I'm so happy to have met you! I always share your book with everybody and anybody. Hey, I didn't know your separated? Truly, your doing okay? It's been a heck of a couple of years I did know that. Hugs, you are one strong lady. I'm with starrlife; I didn't realize you had separated and I also hope you're doing well with a truly empty nest now! You might have thought you were resting on WDSD, but you got this post out, so you did something about it after all :) Great post, by the way. 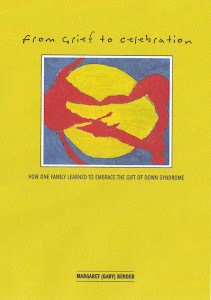 Thank Michelle, life is getting better and yes I guess I did not rest on WDSD - but then again how could I? I didn't realize about your separation either, but I hope this is the beginning of a wonderful new chapter, no matter what came before. Thanks so much for your kind words. I am looking forward to a new chapter...but getting through the preface is challenging! Yes, you will write a post very similar to mine in 20 years and although all our kids have different futures...they DO have futures of promise!